A deep, Oloroso Sherry colour, with a hint of green at the rim. Really rich, fig-like intensity, with notes of dates, fragrant fine old Sherry-like style on the nose. Dense and intense on the palate, really rich dried figs, dark fruit, hints of molasses, some soft tannins and crisp acidity balancing it out. Dried figs and dates again on the finish with a twist of celery salt. Not really any red fruit character remaining, but swathes of dark brown and black fruit. Elegant and fine, a real treat. The Symington family has released a Port that dates back to the arrival of their great-grandfather Andrew James Symington in Portugal in 1882. This intense, rich wine has been maturing for over 130 years, and the family has only bottled one of the remaining three barrels. As one would expect from a Very Old Port, the palate has notes of rich dried figs, dark fruit and hints of molasses, alongside some soft tannins and crisp acidity that balances it out. Graham’s has released only 656 bottles. Each is individually numbered, in luxurious packaging that reflects the the work of the very finest artisans of the three nations from which the Symington family is descended: Scotland, England and Portugal. Hand-made crystal decanters designed by Portugal’s leading glass manufacturer Atlantis are adorned by sterling silver bands, moulded and engraved by Scottish Silversmiths Hayward & Stott. 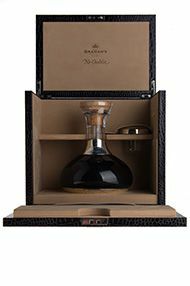 Finally the Port is presented in a bespoke presentation box handcrafted with the finest leathers by quintessentially British brand Smythson of Bond Street.